Our admin console provides an easy way to upload hundreds or thousands of products in one go. This same tool allows you to keep your product catalogue up to date with price changes, de-listings, and other ongoing changes all in a single spreadsheet. Before you use this tool, it is best to upload a single product so that you understand what is being done behind the scenes. Here are the instructions for how to add a product. Click on the ‘Action’ button at the top of the screen and then click on ‘Import Products’. This will open up the 4-step bulk upload tool. If you have already got some product information in Onsight, then this step will download all that information for you so that you can make and upload changes. If you have no existing data you will need to download the datasheet anyway so that you will know how to structure your product datasheet for uploading into Onsight. So click the “Download” button and save the spreadsheet somewhere you will find it easily. Each row in your spreadsheet represents one of your products. Each column contains some important information about your product. Let’s go through them one by one. Onsight ID is the unique number we give to each one of your products in the Onsight Database. Why is it in this sheet? Well, it helps us to know which products you want to update when you want to change your data. For example if you want to change the name, description, product code and other information relating to a specific product, we would not be able to know WHICH product’s information to change without the Onsight ID. If you’re uploading new products, leave this column blank. If you’re updating existing ones, then keep the same Onsight ID that was downloaded in the sheet to start with. Fill in the product name here. Master products are used to group very similar products together. For example: if you sell t-shirts, and have a particular type of t-shirt called a Plain T, but it comes in different colours and sizes, then you could use a master product called “Plain T” and a variant for each option that you offer – “Plain T Red XL”, PLain T Blue S”, etc. Do you have to? No, you can create a new product for each of your products – but using master products and variants can make things a little easier to manage over the longer term. There are two important columns if you want to make use of master products and variants. 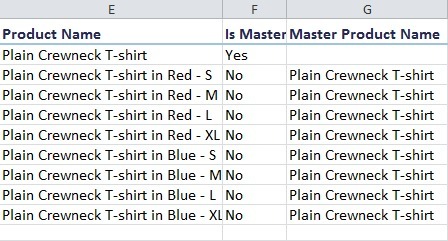 Firstly, if the row represents a master product, then “Is Master” must be set to “Yes” (it must be “No” if the product is a normal plain vanilla product or a Variant). Secondly, if the row represents a variant, then “Master Product Name” must contain the exact same name as the master product’s name. Onsight is a visual selling tool so we need images for each of your products. We recommend that you first complete the rest of this document to upload all your product information without images and then afterwards you can upload your images. There are two ways to upload images in bulk. Please see this guide for detailed instructions on how to bulk upload your images. Enter your product’s price here excluding any taxes. To create or manage taxes that must get applied to your products, please go to Setup > Configuration and click on the “Tax Types” tab. This is where you specify which taxes must be applied to the product. Of course, you need to have set up the taxes first. Then you can fill in the tax name into this field. To set up your taxes, follow this article. Categories cannot contain both subcategories and products. Therefore, if a category already has products in it, you can’t create a new subcategory, and if it already has subcategories you won’t be able to add products to it. Master Products and Variants must both be in the same category. The custom field columns will only appear if you have defined custom fields for your products and if you have created some values for those custom fields. The columns will be named: ‘Custom Field Name 1’ and ‘Custom Field Value 1’ , etc. . Custom fields allow you to store additional information for each of your products. This will then be displayed in the catalogue on the mobile app. It can also be displayed on your orders and quotes. Custom fields can be added by inserting additional columns after the categories columns.